Headaches have for a long time been my second archenemy. Extreme fatigue has always been my biggest archenemy, but the few times I actually felt like I had a bit of energy the second one was waiting in the background. 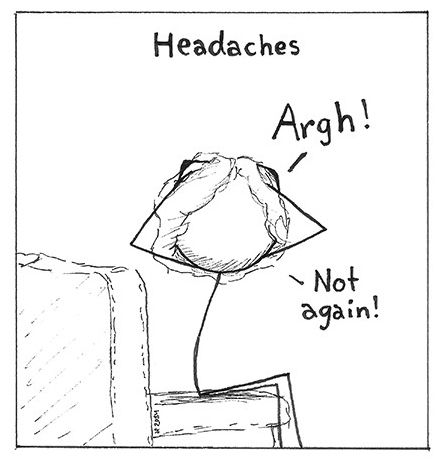 I have two kinds of headache: one in my forehead that feels like my head will explode, which I believe is “just” tension headache and one that is a pain in the back of the head piercing down the neck and into the shoulders. The first kind is almost there every day in the afternoon and can be explained with me having to concentrate to keep active and upright for an entire day. It hurts and makes it hard to concentrate, but the usual ways of handling tension headaches helps (cold wraps, headstands, massage etc.). The second is much more severe! When I feel POTS-bad, it is always there, and almost nothing makes it go away. It feels like my neck is made of bricks that are corroding and no matter how much I try to concentrate on relaxing it will not go away. When I have an attack with dizziness, loss of function and spasms it always starts with a cold/wet feeling in the back of my head that spreads out. And there seems to be a correlation between that feeling and the headache that comes from the back of my head. I went to a physiotherapist, who gave me some treatment that should help with this. Unfortunately, this particular practitioner was 1/2 hour away from me, and the journey there was so bad that the treatment did not help. In fact, the journey made me sick multiple times. So I cannot say if that kind of help work (at the time I am looking into finding a similar service closer to my home). I have also tried having regular massages, but that only seems like a quick-fix that works for a couple of hours. I have heard some rumors that some POTS-patients benefit from strengthening their neck to combat both the neck-based-headache and POTS in general, so the ever believer in a cure through my own body, I have started making numeral neck-strengthening exercises. As an eager yoga-practitioner, I started out with the neck exercises through that particular kind of exercise. The results were quite amazing. I diminished my neck-pain a lot and had fewer instances of neck-based-headache plus fewer POTS attacks. All just by focusing on strengthening the neck! Since the neck is a very vulnerable area and a lot of damage can be done by too eager exercises I must recommend consulting a doctor or another health professional before doing anything. Overall I must say that the only thing that helped me with the pain was yoga. Yoga plus breathing exercises help tremendously with the tension headaches, while they combined with a focus on strengthening the neck can give some relief to the neck-based-headache. After I started using Gutron, both types of headaches have also diminished. The medication combined with regular yoga exercise have changed my life, so I now only have headaches once or twice a week where it before was every day. But that’s just what helps me. What helps you? The content on this page is my personal experience with living with POTS. I am not a doctor or in any way a health professional, so contact your doctor before following any of my advice. Hi I also get headaches which I think are tension. The pain is on my forehead and temples. I get them daily. It hurts so bad all I can do is sit down and wait for the headache to go away. It feels like my head is going to explode and my forehead gets really hot. I believe that I have POTS but I have not been diagnosed yet. These headaches are driving me crazy though, especially when I have my period.